Today we welcome Amber as our guest blogger! Hi! I'm Amber and I blog over at The Hungry Mountaineer. I love to share my adventures in travel, trail running and the great outdoors in general. Whether I am camping or fishing or just taking my dogs for an early morning forest hike, crazy things seem to happen to me. I love to write about all my mountain adventures above six thousand feet. In the last two years I have been trying to transform myself into an athlete and trail runner and turn my diet into one that's extremely healthy (but without giving up my one true love, cheese!). My boyfriend and I are trying very hard to live this healthy lifestyle and luckily we both love to cook! We have a running joke that every meal he cooks for me is the best thing he has ever made me. I feel like every time I take Carly on an adventure it is the best day of her life. We use the word "adventure" in our household now because she can understand "hike" She may just be getting smarter, slowly. "This is why CATS are better pets!" Yeah not the way I wanted to start out my evening; getting in the middle of two dogs trying to murder each other. So let's just say dinner tonight turned into me throwing all the veggie leftovers we had together into a stir fry. 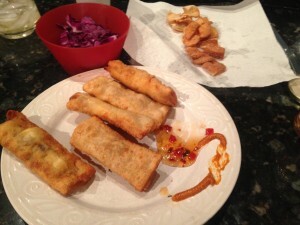 Than I thought I would stuff it in some egg roll wrappers.The results were simply amazing! Especially for a thrown together meal! You have to try these with sweet chili sauce! I pretty much add any extra veggies in my fridge to this delicious stir fry, cook some eggs, add spicy peppers, nuts and cilantro and throw the whole thing in an eggroll. Oh and then I deep fry it, because, well, we can't be healthy all the time. Did you know coconut oil is amazing for deep-frying? It makes everything from chicken drumsticks to donuts taste amazing. Plus if you have left overs the coconut glamour is more intense the second day! You can use more coconut oil to deep fry these but I hate to waste the oil so I try to use as little as possible. Combine all the veggies with about a tablespoon coconut oil and stir fry. Add the grated ginger and the garlic. Scramble in the eggs and add the cashews and cilantro to the top. Lay out the egg roll wrappers with left over egg on the side and a pastry brush. Rub egg all over the sides of each eggroll wrapper. Put a line of veggies in the middle and roll it up carefully, tucking in the edges, burrito style. Fry these eggrolls in the coconut oil.